Seat base only 12 anod ribbed Finish: AnodizedHeight: 12"..
Seat base only 15in ano ribbed Finish: AnodizedHeight: 15"..
Seat base only 18-23 ano ribbe Finish: AnodizedDescription: Friction LockHeight: 18"-23"..
Seat base only 12-17 anod ribb Finish: AnodizedDescription: Friction LockHeight: 12"-17"..
Seat base only posi 18-23 ribb Finish: AnodizedDescription: Positive Pin LockHeight: 18"-23"..
Seat base only posi 12-17 ribb Finish: AnodizedDescription: Positive Pin LockHeight: 12"-17"..
Seat base only 24 anod ribbed Finish: AnodizedHeight: 24"..
Seat base only 30 anod ribbed Finish: AnodizedHeight: 30"..
Seat base only 9 anod ribbed Finish: AnodizedHeight: 9"..
2-7/8" diameter smooth stanchion tube. 9-1/4" diameter 6 hole base plate. Anodized aluminum. Stainle.. Bearing set for swivel spider Finish: Delrin Bearing SetDescription: ..
2-7/8" diameter stanchion tube, 9" diameter 6 hole base plate. One piece casting design for mounting.. Smooth positive lock action slide, convenient spring loaded lock and release lever, wobble free desi..
2-7/8" diameter stanchion tube, 9-1/4" diameter base plate. Mounts any seat securely. 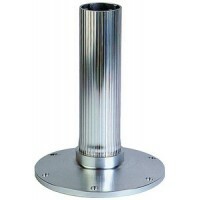 4 prong spider..
2-7/8" diameter stanchion tube, 9" diameter base plate. Locks at desired height. 4 prong spider swiv..
Stanchion tube, 9.25" diameter 6 hole base plate. Provides solid base of support for a variety of se..
Seat slide & swivel spider set Travel: 7"ABYC: AFinish: Anodized..
Swivel spider smooth anod. Finish: Powder Coat..
Spider swivel casting Finish: AnodizedDescription: ..